Jaguar X-type to be dropped | What Car? 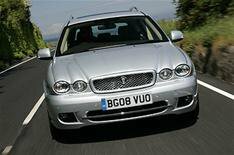 Jaguar's X-type has fallen victim to the global recession. Production was set to continue until 2010, but Jaguar has brought the car's demise forward to cut costs. Up to 300 jobs will be lost at the Halewood factory where it's built, but Jaguar has said all cuts will be through voluntary redundancies. A three-week shutdown will also take place later this year, due to 'on-going weakness in the market'. David Smith, Jaguar Land Rover's CEO, said: 'Our industry has been especially badly hit by the recession and the premium sector more than others. Jaguar Land Rover's sales have fallen by 28% in the past 10 months. The X-type was launched in 2001 as a rival to cars such as the BMW 3 Series and Audi A4. It was the first Jaguar with four-wheel drive, and the first to be available with a diesel engine. Jaguar says that more than 350,000 X-types have been sold.